Art Gallery Cards: Father's Day, Pretty Spring Card and a Preview! We're getting set for Father's Day and of course we could not have a class go by without getting our "girl" on! Here we are creating to our heart's content! There are always lots of laughs, fun and camaraderie!! Love these gals!! Next week it's a complimentary card for a Brighton gift bag. 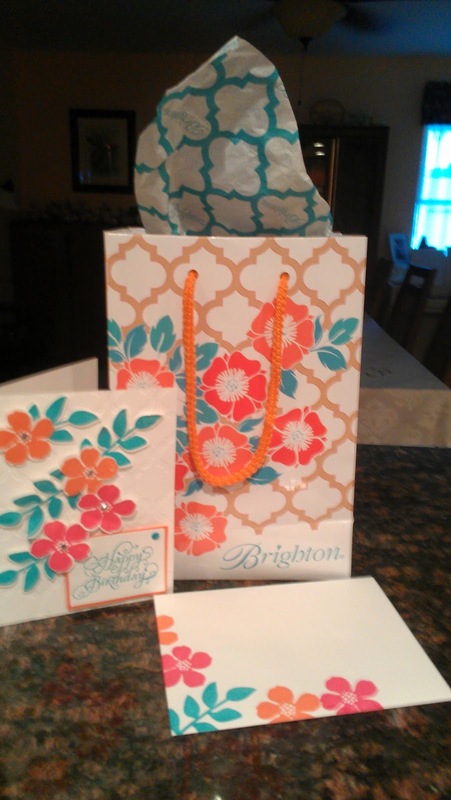 Happily, it screamed Melon Mambo, Calypso Coral, Bermuda Bay and the Mosaic Embossing Folder!! There's a preview down below! I also love that they are all confident enough to follow their own creative instincts and think outside of the box if the spirit leads them! Love those Happy Watercolor (soon to be gone forever-sniff!) smudges and that pretty Crisp Cantalope ribbon, paper and ink!! A different kind of smudging with this card--We sponged around the edges with Crumb Cake ink.